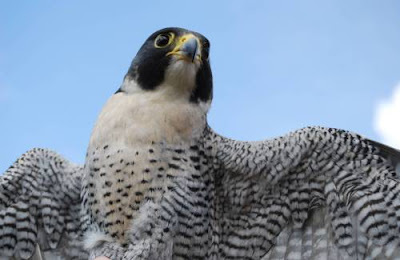 Ozzy, REGIs resident Peregrine Falcon, made the news this week. Maybe it was his former mate and her new family that really made the news but Ozzy is part of that still with the local human population. Reporter Rob Metzler wrote a terrific article in Sundays Wausau Daily Herald (May 4, 2009). A link to that article is below. 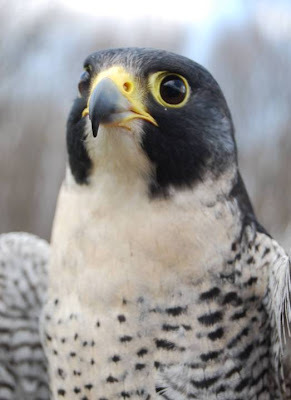 Ozzy was hatched in Green Bay in 2002. The name Ozzy came from a contest at that time to name the hatchings. He was shot near the Weston Power Plant in June of 2007. He has lived at REGI since that time. Enjoy the article and the photos taken May 2, 2009 of the stunning Ozzy. Check out this link to the Wausau Daily Hereld for the full article!